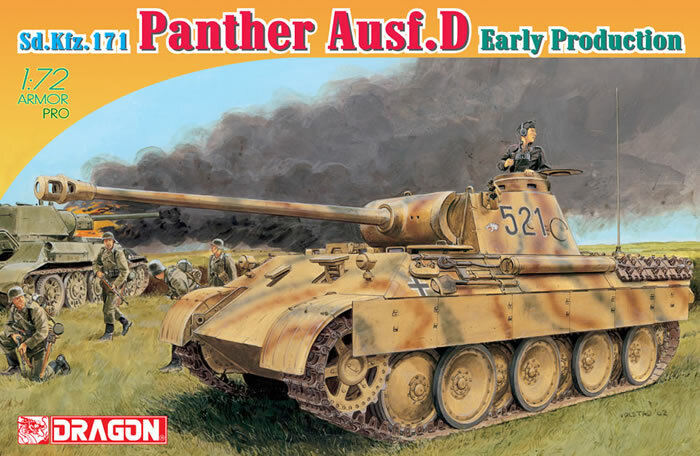 After a pause of several years, DML has now returned to 1/72 scale Panthers with this totally new effort for an early production D model. 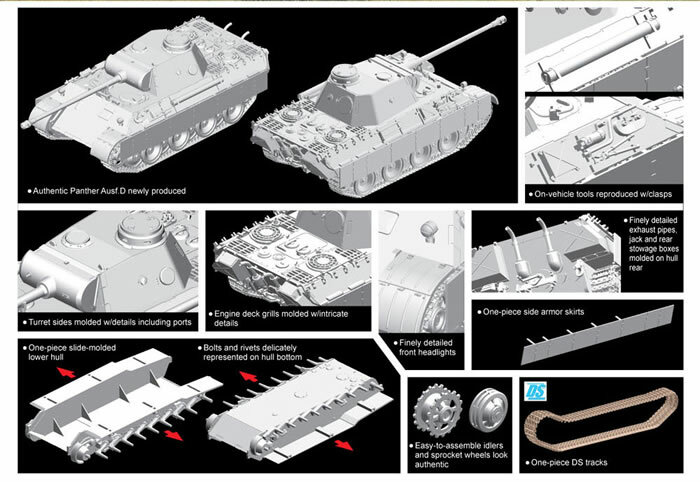 It comes with skirts and most of the details German armor fans associate with early model Panthers such as the gun port in the glacis vice the machine gun ball mount and the stepped hull side profile. The hull consists of three parts - upper, lower and stern plate. The road wheel arms are premolded into the lower hull and like past DML Panthers the intermediate road wheels are linked together to speed assembly and ensure accurate fitting to the model. The idler wheel consists of three parts (two castings and an outer ring). The tracks now come as with all recent DML 1/72 scale kits with an indicator that the tracks are to be 182mm in overall length. These measured out right on the money (the “overlap” is noted as not counting for length so it is measured from link to link). Five finishing options are provided: Pz.Abt. 52, Pz.Rgt. 39, Kursk 1943 (tricolor stripes, black 521); Pz.Rgt. 15, 11th Panzer Division, Ukraine 1943 (tricolor, black 101); 4./Pz.Rgt. Grossdeutschland, Karachev 1943 (green over sand, black 445 with panther outline); 8./Pz.Abt.52, Pz.Rgt. 39, Kursk 1943(tricolor, black 824); 7/Pz.Abt. 52, Pz.Rgt. 39, Kursk 1943 (green over sand, black 745 – the old Aurora tank markings). A nice if busy sheet of Cartograf decals covers the lot. Overall it is nice to see this “Gen 2" Panther kit from DML in this scale, borrowing the good points of past kits but correcting some of the shortcuts from diecast models.